INDIANAPOLIS, Ind. – Kiwanis International recently named Sleeping Children Around the World (SCAW) as its 2010 World Service Medal recipient. SCAW was honored for ensuring that more than 1 million children have a comfortable night's sleep. The Kiwanis World Service Medal, established in 1985, recognizes individuals who devote a significant part of their lives to meeting the needs of others. “Sleeping Children is thrilled to be acknowledged by Kiwanis International,” said SCAW Chairman Dave Dryden. 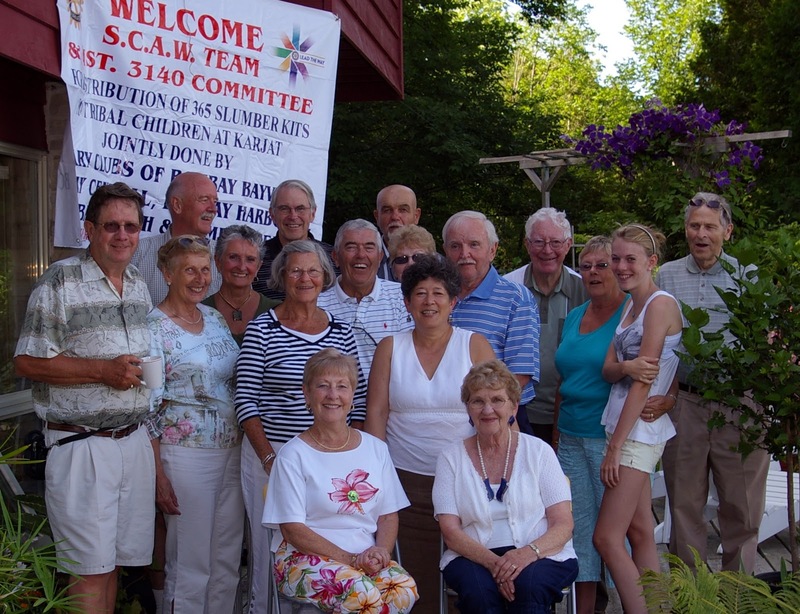 Dyrden’s parents Murray and Margaret Dryden founded SCAW in 1970. Their dream was a world where every child has a bed to rest their head at night. Donations provide bed kits to children wherever they’re needed—typically in underdeveloped and developing countries. To date, the organization has raised more than $23 million to provide bedkits for children in 33 countries. The World Service Medal honors inspiring examples of individuals who have recognized a need and taken personal action to meet that need. One medal is awarded each year and the Kiwanis International Foundation adds a US$10,000 grant to assist the honoree in furthering his or her service work. Previous winners have included Mother Teresa, actors and humanitarians Sir Roger Moore and Audrey Hepburn, and First Ladies Nancy Reagan and Rosalynn Carter. There was a gathering of Grey/Bruce friends of Sleeping Children Around the World in Kemble on Saturday, July 17th to celebrate the Fortieth Anniversary of our charity. A couple days ago, I wrote Part 1 of a series of pieces on Dave Dryden, former goalie and current driving force behind Sleeping Children Around the World (SCAW). My original goal was an online piece for Global Traveler (which ran Wednesday), but I had so much material that I had to share it on this site. Dave went from stopping hockey pucks to helping children around the world sleep better through SCAW, the organization his father had started in 1970. Last year, SCAW achieved the original goal of one million bedkits distributed. Having passed that milestone, I asked Dryden what was next. "Now that we have achieved the one million bedkits we have spent much time this year looking forward through a Strategic Planning process. What we have learned is that it is more than just about setting another target number. Yes, it is important that we reach another million children, but it is even more important HOW we do this. We encourage giving from the heart, not from a guilty conscience. If we can be a trusted conduit for donors who really want to help kids, then we will feel that we are doing our best." Dryden told me about previous bedkit recipients coming out to meet the SCAW group many years later to thank them again and how awesome it feels to see their happiness and love. Dryden's genuine passion comes through clearly when he describes how this sort of validation and motivation really "turns his crank". I couldn't let Dryden go before I asked him about his career. For his favorite memories, he mentioned playing against his brother, his first game (when he was called from the stands to fill in for Gump Worsley), playing with Bobby Hull and Wayne Gretzky and playing in an All-Star game with Gordie Howe against the Russians. "I loved inventing and improving my 'tools'. So I got a great thrill from redesigning my gloves, pads and of course designing the first cage-mask combination." Dryden said his hockey career was more than he could have expected. He also said his teaching career was fulfilling and satisfying (although demanding). After teaching, when he returned to hockey as an Injury and Equipment Consultant, he found that interesting. Finally, his involvement with SCAW has been a thrill. Clearly, Dryden is a special man who loves what he does and gives it his heart. Dryden says he still receives hockey cards (for autograph requests) through the mail and is amazed by it. He is also amused by the many pictures (some of which he has never seen before) sent to him. Recently, his grandchildren uncovered a gem on YouTube, Wayne Gretzky's first goal...right past Edmonton Oilers goalie Dave Dryden! Also on YouTube is the rest of my interview with Dave Dryden. We talked about the Blackhawks recent Stanley Cup win, a bit more on SCAW and of course, Wayne Gretzky's first goal. I really would like to thank Dave Dryden for his time and consideration. It was a thrill speaking to him. I enjoyed following his playing career (even after he left my beloved Blackhawks) and collecting his hockey cards (many of which he later signed (through the mail) for me. It has been a pleasure learning about Sleeping Children Around the World. Dryden is a fascinating man. Please, check out SCAW when you have a chance. It truly was my honor doing this. One of the great things about writing for Global Traveler is that I can do pieces about some of my childhood favorites. I recently had the chance to do just that, by interviewing Dave Dryden, former NHL and WHA goalie and current President of Sleeping Children Around the World (SCAW). That piece ran online yesterday on GT's site. I learned so much about Dave and SCAW that I had to share more of the info here. Dave was an outstanding junior hockey player who hoped to gain a university scholarship to pursue his goal of teaching. In 1962, while attending a game between the Toronto Maple Leafs and New York Rangers, Dryden was plucked from the stands when Rangers goalie Gump Worsley was injured. In those days, teams did not carry a backup goalie. Unfortunately for Dryden, he was now considered a pro and his hopes of a scholarship were gone. He went on to have a fine career with the Chicago Blackhawks, Buffalo Sabres, Chicago Cougars and Edmonton Oilers. Dave played in the 1973-74 NHL All-Star game, gave up Wayne Gretzky's first pro goal and was the WHA MVP for the 1978-79 season. After retiring, he coached for a bit, but eventually his passion led him to SCAW, the organization his father Murray had started in 1970. Murray Dryden loved the beauty of a sleeping child. He loved photographing them and planned to put together a book of such photos. On one trip to India, he saw a child sleeping in a street and decided he wanted to do something about it. Thus SCAW was born and fifty bedkits distributed on the first of what would become many such distribution trips. (A bedkit consists of a mattress, a pillow, a blanket and whatever other bedding necessary for any given area.) Murray set a goal of one million bedkits by 2010. Sadly, Murray passed on in 2004, but Dave oversaw the one millionth bedkit distributed last year. SCAW has helped make Dave quite a global traveler. According to him, he has logged in over 300,000 air miles on trips to India (5x), Bangladesh (4x), Tanzania (2x), Honduras, Uganda, Kenya and the Philippines. I asked Dave about problems during the travels. "During the early days of SCAW, my dad did the distributions by himself and due to his adventurous nature, was in some very dangerous situations. He was often "flying by the seat of his pants". Now that we have more distributions each year and travel in teams of 6, we need to do a great deal of preparatory work before a team leaves. Fortunately, this has minimized the "scary situations". However, virtually on every distribution I have been on, there have been situations where our team is out in a rural area usually using a school playground as our base of operations and having about 600 bedkits sitting out ready to give them to 600 previously selected children. Due to curiosity, thousands of people have gathered to see what is going on. These are all very poor people who would like to get a bedkit. Will they walk in and disregard our process to get a bedkit? There really isn't anything to prevent that. This has never happened. I am amazed at the self-control exhibited by the rural people." I inquired about travel memories. "When I think of travel memories, if I am on vacation, what I remember is places and things I saw. When I get back from a SCAW distribution trip, my memories are all of people. I am always amazed at the universality of the children, rich, poor, in India, in Africa, they are all the same. They have bright inquisitive and enthusiastic eyes. They smile, they cry, they need love and they all do need a good night sleep to be healthy. They and their caregivers all value education. The adults are like us. In fact, some of the aspects of life that they value most, I think that we sometimes forget. The importance of "Family" is an example. I remember talking through an interpreter with an impoverished rural farmer in India, who very sincerely said he felt sorry for us. I was quite startled at his statement. He commented on the breakdown of "the family and our seeming need to carry guns". I didn't have a good rebuttal." Dave had a lot more interesting things to say and I will be sharing those here in the next few days. In the meantime, please check out Sleeping Children Around the World. Ken Graham and Clarence Deyoung in Toronto, Canada-Late 2000's. SCAW was founded by Murray and Margaret Dryden. Murray always thought a sleeping child was a beautiful thing on so many levels. He decided to capture this beauty by photographing some sleeping children, which he planned on turning into a book. On a picture-taking trip in India, he saw a child sleeping in the street and decided to do something about it. SCAW was born in 1970, and 50 bedkits were distributed in Pune, India. Both Dave and SCAW have come a long way from their beginnings in the Dryden home in Toronto. Dave and his younger brother Ken went on to have stellar pro hockey careers. After retiring, Dave coached for several years, but his true calling was continuing what his father had started. What makes the success of SCAW more interesting is that they do no advertising. Dave told me their marketing committee (with a budget of zero) has to find creative ways to publicize SCAW. Perhaps their biggest and best publicists are the 100 volunteers who travel for SCAW. They come back so pumped up and spread the word themselves. They do also take advantage of free services, such as Facebook and a blogsite. While distributing the bedkits, Dave had been to numerous countries, but says he has not been to a museum or art gallery, nor to the tallest buildings downtown. Instead, he spends his time with the people. He is always amazed at the universality of children worldwide, rich or poor. He also said “family” is probably the most common value he encounters. SCAW has distributed bedkits in more than 33 countries. Because of the efforts of SCAW and people like Dave, more than one million children have received bedding. He is certainly a humanitarian, and over the years, he has become quite a global traveler.